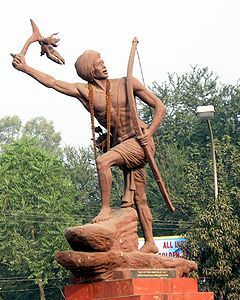 Birsa Munda (1875–1900) was an Indian tribal freedom fighter and a folk hero, who belonged to the Munda tribe, and was behind the Millenarian movement that rose in the tribal belt of modern day Bihar, and Jharkhand during the British Raj, in the late 19th century, thereby making him an important figure in the history of the Indian independence movement. His portrait hangs in the Central Hall of Indian Parliament, the only tribal leader to have been so honored. Birsa Munda was born on 15 November in the year 1875 on a Thursday and died on 9 June 1900 and hence was named after the day of his birth according to the then prevalent Munda custom. The folk songs reflect popular confusion and refer to both Ulihatu and Chalkad as his birthplace. Ulihatu was the birthplace of Sugana Munda, father of Birsa. The claim of Ulihatu rests on Birsa’s elder brother Komta Munda living in the village and on his house which still exists albeit in a dilapidated condition. Birsa’s father, mother Karmi Hatu, and younger brother, Pasna Munda, left Ulihatu and proceeded to Kurumbda near Birbanki in search of employment as labourers or crop-sharers (sajhadar) or ryots. At Kurmbda Birsa’s elder brother, Komta, and his sister, Daskir, were born. From there the family moved to Bamba where Birsa’s elder sister Champa was born followed by himself. Soon after Birsa’s birth, his family left Bamba. A quarrel between the Mundas and their ryots in which his father was involved as a witness was the immediate reason for proceeding to Chalkad, Sugana’s mother’s village, where they were granted refuge by Bir Singh, the Munda of the village. Birsa’s birth ceremony was performed at Chalkad. As a Munda, he was very respectable in the society and also it was said that Birsa had the strength of 100 elephants as he was seen bending British rifles by his own hands and also he was seen tearing machines made by the British in the factories that they attacked. Birsa’s claim to be a messenger of God and the founder of a new religion sounded preposterous to the mission. There were also within his sect converts from Christianity, mostly Sardars. His simple system of offering was directed against the church which levied a tax. And the concept of one God appealed to his people who found his religion and economical relig healer, a miracle-worker, and a preacher spread, out of all proportion to the facts. The Mundas, Oraons, and Kharias flocked to Chalkad to see the new prophet and to be cured of their ills. Both the Oraon and Munda population up to Barwari and Chechari in Palamau became convinced Birsaities. Contemporary and later folk songs commemorate the tremendous impact of Birsa on his people, their joy and expectations at his advent. The name of Dharti Aba was on everybody’s lips. A folk songs in Sadani showed that the first impact cut across the lines of caste Hindus and Muslims also flocked to the new Sun of religion. All roads led to Chalke. Give Responses for "Birsa Munda : Freedom Fighter Profile and Biography"